BOTTOM LINE: A politically explosive, if didactic, look at the animosity between Israelis and Palestinians that focuses on one act of terrorism and its long-term impact on two individuals. Land of Fire has its roots in an actual terrorist attack on an El Al Airline crew that took place in 1978. Nonetheless, Argentinian playwright Mario Diament’s two-act drama is a work of fiction. In it, the seemingly intractable problems of Palestinian-Israeli coexistence are plumbed and the so-called victim and victimizer roles are interrogated. In the particular scenario depicted in Land of Fire, Yael (played by a visibly tormented Dagmar Stansova) confronts Hassan (played with a mix of fury and contrition by the excellent Mihran Shlougian) about his role in an attack that wounded her and killed her co-worker. It’s now 22 years later, and both Yael and Hassan are middle-aged. As Hassan tells Yael his family’s story—starting with their forced removal from the land and subsequent settlement in a fetid, overcrowded refugee camp—the audience is made privy to a riveting history. Later, when Yael asks her father (David Mandelbaum) about his role in the founding of Israel, the story comes full circle to include a horrific recitation of rationalized atrocities that leaves Yael in deep pain and abject sorrow. As is obvious, it’s heavy material. Land of Fire focuses on what it means to forgive, but while Hassan is the play’s moral compass, the frame is nonetheless more heavily weighted toward the victim, Yael, than the victimizer. In addition, much of the dialogue sounds unnatural, especially between Yael and her husband (Scott Zimmerman) and their interactions seem more like an exchange of speeches than actual conversations, although this could be due to the play's translation from Spanish. Scenes with Hassan’s attorney ( Naci Baybura) and the grieving mother of Yael’s murdered colleague (Marilyn Lucchi) are extraneous and add little to the production. Still, thanks to a spare, never-changing set designed by Mark Marcante that simply project bars on a back wall to indicate Yael’s movement between her home and the jail, even these distractions do little to deflect attention from the intense conflict between the two protagonists. It’s a sober assessment but it also asks a pointed question: Is there any other way to stop the inequities that have ruled the region for nearly 70 years? 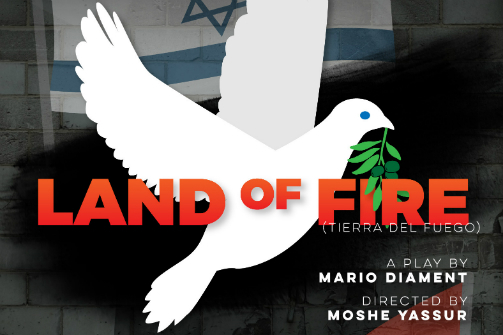 Land of Fire is written by Mario Diament, translated by Simone Zarmati Diament, and directed by Moshe Yassur. It is produced in association with New Yiddish Rep. Set Design by Mark Marcante. Lighting Design by Alexander Bartenieff. Sound Design and Compsed by Ellen Mandel. Costume Coordinator is Gina Healy. Dramaturg/Program Editor is Beate Hein Bennett, Ph.D. Production Stage Manager is Mark Brystowski. The cast features Dagmar Stansova, Mirhan Shlougian, Scott Zimmerman, Naci Baybura, Marilyn Lucchi, and David Mandelbaum.